Bingham Canyon is located in the Oquirrh Mountains approximately twenty-five miles southwest of Salt Lake City. The canyon was first settled in August 1848 by two Mormon pioneers, Thomas and Sanford Bingham. The two brothers had been sent to the area by Brigham Young, who requested that they take a herd of horses and cattle belonging to himself, the Bingham family, and others up to the high land around the main canyon. They erected a small cabin about one-and-a-half miles below the entrance to the canyon on the north side of its creek. The canyon proved to be an ideal place not only for herding cattle, but also for cutting timber. For the next few years, the Bingham brothers spent their time engaged in these pursuits, and also in prospecting for valuable minerals. Some ores were found but the Bingham were advised by Brigham Young not to engage in mining at that time. The policy of the Mormon Church discouraged mining because all available labor was desperately needed to produce the necessities of life. There was also the fear that mining would attract non-Mormons from out of state and have a degrading effect upon those who engaged in it. The ore finds were soon forgotten after 1850 when the Binghams moved to settle Weber County. 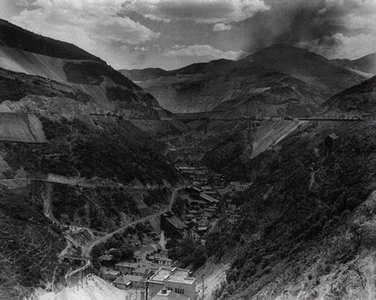 Nevertheless, Bingham Canyon continued to be used as an abundant source of timber. Mormon leaders recognized this economically valuable resource when, in 1850, they granted permission for a sawmill to be erected in West Jordan by Archibald and Robert Gardner. A mill was constructed in the canyon itself in 1864 when Brigham Young persuaded a group of pioneers headed for Idaho with a sawmill from the East to build it by Carr Fork. During this time, many wagonloads of timber were taken from the canyon's hillsides, including most of the timber used to construct the roof of the Salt Lake Tabernacle. In 1863, as logging operations continued, valuable ores were again discovered in the canyon by George B. Ogilvie, Archibald Gardner, and some soldiers from Fort Douglas. The ore finds were sent to General Patrick Connor, who was the commander of the Third California Infantry, stationed during the Civil War at Salt Lake City's Fort Douglas. He assayed the ore and found it to contain rich quantities of both gold and silver. General Connor then supervised the organization of the West Mountain Mining District, which included Bingham Canyon and most of the Oquirrh Mountains. The rush for the riches of Bingham Canyon then commenced as Connor encouraged his soldiers, many of them veterans of the California gold rush, to prospect. He hoped that the mining fever would attract non-Mormons from outside of Utah to come to the state and thus dilute the influence of Mormons. A few rich strikes were made but the high cost of wagon transportation made the discoveries uneconomical. This almost caused the canyon to be abandoned. Mining continued, however, when men switched to placer mining in Bingham Creek. One claim yielded more than $2,000,000 in gold by 1868. However, for most miners, the placer deposits could only barely provide enough food to eat. Before 1869, fewer than 100 miners, mostly Welsh, Irish or Cornish in origin, lived in the canyon. The arrival in 1873 of the Bingham and Camp Floyd branch of the Utah Central Railroad dramatically changed Bingham's fortunes. This event revived lode mining and soon rich strikes were paying off. Milling and smelting facilities which made mining even more profitable soon sprang up in the canyon as well as in the Salt Lake and Tooele valleys. The end of the nineteenth century saw the consolidation of the small claims of many individual prospectors in Bingham Canyon into the hands of copper giants like the Boston Consolidated and Utah Copper Companies. The formation of these companies not only required a large supply of capital resources, but also created a demand for cheap labor. The flood of immigrants that resulted made Bingham one of the most ethnically diverse areas in the state of Utah. It was estimated that in 1912, 65 percent of the residents were foreign born. Each ethnic group settled in a different area of the canyon, elevating the population to more than 15,000 by the 1920s. In the process, these groups created distinct communities. Finns, Swedes, and Norwegians came to Carr Fork; Eastern and Southern European Slavs and Italians to Highland Boy; Greeks, Japanese, British, and Scandinavians to Copperfield; Austrians, Welsh, Cornish, and other Britons to Lark; and the British, French, Irish, and numerous others to Bingham. As a result the canyon was later dubbed by many to be a literal "League of Nations." Smaller camps with names like Frog Town, Freeman, Heaston Heights, Markham, Copper Heights, Dinkeyville, and Terrace Heights could also be found. Bingham, due to its steep topography, had room for only one main street that snaked its way through nearly seven miles of canyon. It was joked that, due to the narrowness of the canyon, dogs could only wag their tails up and down. These close confines added to the tragedies that resulted from the numerous fires, avalanches, and floods that continually plagued the residents of the town. These hazards and the canyon's limited space led to the construction of Copperton at the canyon's mouth in 1926. This town, designed as a model mining community, was originally built by the Utah Copper Company not for the average miner, but for the company's management. The homes, which made extensive use of copper in their construction, were rented to employees until 1956, at which time they were sold to the residents. The variety of people in Bingham Canyon helped transform "the hill," as the mining operations of the Utah Copper Company (later Kennecott Copper Corporation) were originally called, into the world's largest open-pit copper mine. This expansion continually required the purchase of living areas for miners as the old towns of the canyon were gradually swallowed. Highland Boy and Copperfield were dismantled by 1960 and the last buildings in Bingham were torn down in 1972. Lark had disappeared from the map by the end of 1980. Copperton remains the sole survivor of the communities that helped to make Bingham Canyon one of the most culturally diverse and rich areas of Utah. See: Leonard Arrington and Gary B. Hansen, "The Richest Hole on Earth - A History of the Bingham Copper Mine," Utah State University Monograph Series II (October 1963); Lynn R. Bailey, Old Reliable - A History of Bingham Canyon, Utah. (1990); Violet Boyce and Mabel Harmer, Upstairs to a Mine (1976); Scott Crump, Copperton (1978); Marion Dunn, Bingham Canyon (1973).